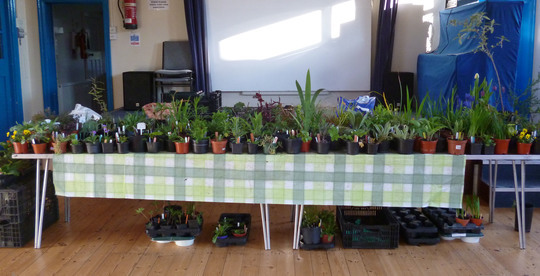 Our village held a garden mart again this year and as usual I had a stall. Plants from the left as you look at it. Sadly many are not in flower yet as they are hardy perennials but I always take my RHS book so people can see what the flowers are like. Plants from the right. Predominately bulbs at this end and luckily some in flower. 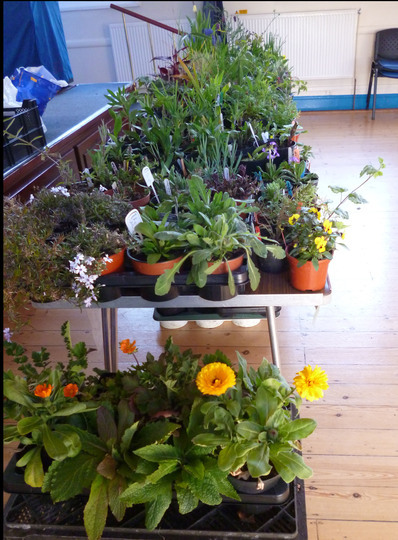 I must have sold well over 100 plants as prices started at 75p and the most expensive on my table £3.50. One of the other stall holders didn’t do as well but his prices were the same as the local gc but his plants were quite small. This sort of event brings in people from the surrounding villages so know what the gc charge. I also have less common/older varieities of plants too so that helps my sales. We were open 9-1 and at the end of the event I had taken £155.35. That will go to our local hospice as usual. One never knows when you might need their services. Previous post: April showers - really! Excellent, looks like some interesting plants. Such a worthy cause, well done all. I'd have bought some for sure. luckily yours buyers were local, I knwo years ago when I tried selling, at local WI market the buyers wanted plants for nothing more or less. Super display and well done for the amount raised. People are fickle Grandadgardener, they would rather pay a high price for something that is beautifully shaped, forced in a greenhouse with a pretty label, than look beyond that and see that the plants will look the same eventually. yes that is so true Honeysuckle a few didn't buy the Echinacea as there were no flowers on it. even telling them it would one said that it would just be a green 'blob' in the garden till then. The gaillardia did have pretty labels as a mate had given me his as he had lots from plants he bout last year. You had a very tempting stall and you did so well. I bet it is an event you look forward to and the money you raised will be so welcome. 3 of my favorite things - tea, cake, plants. It can't go wrong? So glad it was a success. Congratulations! Well done Eileen, all your hard work was worth it. 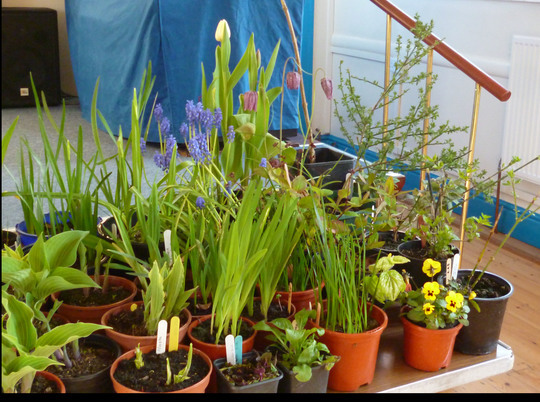 Congratulations on setting out such an inviting looking array of plants and, of course, raising cash for the hospice. Eileen, weren't you glad your "green blob" lady didn't buy from you? Sounds as though there would have been little sympathetic TLC from that quarter! What a marvellous stall - can't imagine where you stored all those - and a very rewarding result too. they live on the back path in front of the greenhouse stera and on the paving infront of the conservatory. OH not that impressed really. But I have to contend with bikes in the outplace so its pretty even really. Pity we dont live nearer, would have been there in a flash, your stall looked very inviting, and at such good prices, you deserved to do well, and all for a very worthy cause.....congratulations. Great stuff SBG! You really are a marvel at living a good life. I would love to buy young plants if I knew of a sale. I do sometimes offer free seedlings online locally but being somewhat of a recluse, I don't like people coming to my house. Your stall looks amazing. Lots of nurturing gone in to that. Glad your stall was a success. It looked very impressive. It's better to under cut the GC's at these events & sell your plants, than price them up & then have to take them all home. I'm afraid people are always looking for a bargain, human nature & the GC's are so expensive, so events like yours are a godsend & all goes to a good cause. Well done on the amount raised. Just short of 300 miles. The weather against me now.